Save on Medical ID Bracelet "Budget Sets"
$49 all-in-one sets include Free ID tag, Free custom engraving and Free med card. Now get these custom sized medical bracelets at an amazing discount price. Now saving your life was never so stylish or so affordable. • Get the advantages of durable, yet beautiful stainless steel that outperforms and outlives sterling silver and gold. • No more worries about tarnishing due to harsh chemicals and salt water. • Free bonus Medical ID Card for your wallet when you buy one of these stylish bracelets. Get Free Engraving and ID Tag! Free Medical Card only with these bracelets. 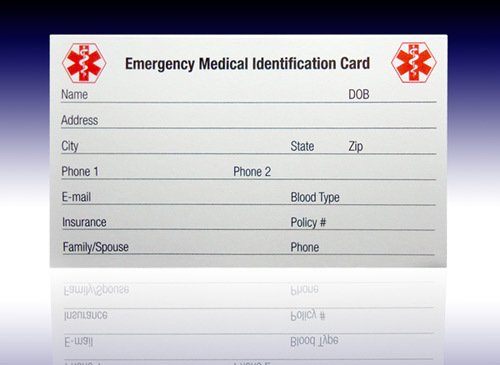 At $3.95 value, this medical ID emergency wallet card has room for just about all your medical history. It has 6 pages of space, and folds down to the size of a business card. Precious metals are not impervious to salt water and chemicals. The truth is that precious metals like sterling silver can tarnish, get pitted and will turn dull from acid skin, salt water, chlorine and other chemicals—even from perfumes and sun screens! What's more, precious metals wear down too fast—while stainless steel can last a lifetime. Styles like you've never seen before are all handcrafted in the USA—right here in Deerfield Illinois! All designer stainless steel chains are accurately custom sized unlike any other major medical bracelet company.